Every car has a history. Some are good and some are not so good. Some turn out to be quite surprising . . . and every once in a while, the pieces of the big Shelby production puzzle start to fit together. The Shelby America Automobile Club (SAAC) has been working on the puzzle for a long time. So, as you can imagine, most of the pieces have been layed down. Sometime ago, I recieved a copy of several handwritten memos in a batch of papers. These papers are part of the Shelby American Automobile Club's collection. I found one memo quite interesting. The memo was dated November of 1967. It was four pages of notes about the GT350 Convertible "show car" being sent to the Hertz Corporation. The 1968, Hertz cars are documented in the 1997 Shelby American World Registry. The vast majority of the cars were GT350 fastbacks with automatic transmissions and air conditioning. So, I was quite surprised to see a memo about a 4spd convertible. Unfortunately, the serial number was not identified. I pulled out my registry to look for the possible serial number. Hmmm, that's odd, I thought. No GT350 convertibles listed for Hertz. I knew, I was on to something very special. That was if I could figure out which car it was. Unfortunately, I was running out of clues fast. I emailed the Shelby Club's 1968 Registar, Vinny Liska. I asked him if he knew anything about the convertible Hertz show car? He stated he did not. [Note: This in itself is very unusual. Vinny is one of the chief puzzle solvers]. I combed the Registry looking for GT350s sent to New York. Production of 1968 Shelbys began in December, 1967. I knew there were only a few cars before that time. I was fairly sure the car in question was # 0301. That car was sent to New York, home of the Hertz corporation. However, there were a few problems. The current owner was "unknown" and I had no way to prove I had found the missing car. Another concern, why did such an early car have a serial number like # 0301 ? I remember reading several of Kevin Marti's great articles about strange cars. If you don't know Kevin, look at the "documentation" page on this website. I didn't have much to go on, but I thought Kevin may be able to help. Sure enough, the FORD records indicated Shelby American only had four cars at the time the memo was written. Even more interesting, there was only one GT350 convertible. That car would later be numbered # 301. I had found it! The other three cars were a GT350 fastback, a GT500 fastback and a GT500 convertible. So, in other words, Shelby had one of each model and one of each bodystyle. These four cars were the first 1968 Shelbys built and all were gold in color! The only GT350 convertible would be shipped to Hertz. AO Smith was a little less than pleased with the quality of the car, so the memo was written. A little more digging actually turned up the owner. The owner, Randy, was quite surprised to hear from me. He was even more surprised to learn the history of his gold convertible. It would be very neat to see this car hit the streets...the first GT350 convertible built and a Hertz show car. Randy is working hard to get that done. I hope to visit him soon and record some of the details on this unique car. Here is some information on the first four Shelbys courtesy of Kevin Marti. I highly encourage you to use his services. 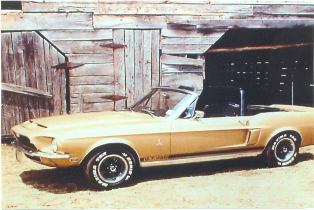 The first GT350 Convertible built: 8T02J110577-00301, a gold and black, 4spd. The first GT350 Fastback built: 8T02J110578-00339, a gold and black, automatic. The first GT500 Fastback built: 8T03J110577-00041, a gold and black, automatic. 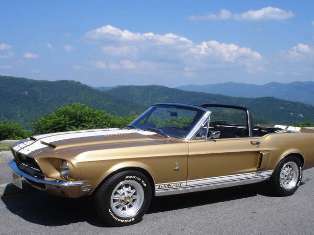 The first GT500 Convertible built: 8T03S110576-00056, a gold and black, automatic. The morals of the story are: It's never to late to track down your history, now is better than later. Cars were not always built in a strict numerical order. Just because you have number one, doesn't mean you are number one.